skills should be considered in the light of the above: because, as well as safeguarding traditions and skills, such transmission is essential to protect the social structure of local areas. Craft working is a widespread type of occupation that supports the local economy and small-scale production. It creates jobs, social stability and potential future development. Many areas have age-old productive realities, which risk extinction for lack of generational handover. Artistic craftsmanship is also the primary motor of sustainable economic development in underdeveloped or depressed areas. As well as a cultural heritage, artistic craftsmanship is a key economic and productive resource: a widespread productive network, made up of small companies, workshops and SMI’s that are deeply rooted in their local territory, and which constitute a not inconsiderable part of economic value created by the manufacturing sectors. The temporary store will be open from Tuesday to Sunday from 10:00 to 19:00, including holidays. Among the proposals there will be demonstrations of craft techniques and issues related to small exhibitions of Japanese Art Festival, Jazz Festival, Festival of Crafts and Bible Week. ViArt, a unique art gallery in the Italian scene because of its exhibiting concept, offers visitors the chance to go on a real journey through the handcrafted products from Vicenza and its surrounding area thereby discovering the wonders that arts, geniality and dexterity of master craftsmen have been able to create. 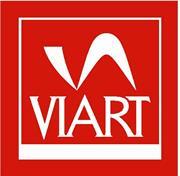 The visiting tour of ViArt is an ascending movement that leads visitors from the earth and earth-related arts and crafts - made of stone, iron and wood - to both physically and spiritually more elevated handicrafts connected with man, namely gold jewellery, textiles, leather goods. The tour then ends on the noble floor where the lightest and most airy materials have been forged to create handicrafts in ceramics, glass, paper as well as musical instruments. Like the tree is the link between the earth and the sky, because it spreads its roots into the ground and raises its crown towards the sky, the artistic craftsman is the link between raw materials and works of art thanks to his geniality and manual dexterity. ViArt offers visitors didactic support: panels with rich information and audio-visual means describe the world of Vicenza’s artistic crafts from the origins to present day reality, highlighting all the most important aspects, offering indepth examinations and curiosities as well as transmitting some interviews with the most famous master craftsmen.